This weekend’s “Open Post” ( <—– click that if you weren’t around last weekend and don’t know what I’m talking about) is hosted by an Alpaca. And Taylor Lautner. This was ACTUALLY sent to us by someone. Yes. This Existed. Someone, somewhere, took a picture of an Alpaca (that may or may not be stuffed- I can’t tell) and put it next to a picture of Taylor Lautner. Why did someone choose to take a furry animal and put it next to Taylor’s face? Are they insinuating that Tay-tay resembles this animal? Is owning an Alpaca & having Taylor as their lover a dream of theirs? Are they just…. weird? Thanks to Kristi for finding this and thinking of us! My first actual “letter to twilight!” I am so giddy. In light of the upcoming DVD release of New Moon I have sat around all day at work (working of course) thinking of fun things to do at your New Moon DVD party! And…. (drum roll please! )…I have come up with the “Official” New Moon drinking game! So grab your beer, mixed drink or cherry coke (for you under aged LTTers) and play along! Take a drink when…. Bella blinks too much in a single second. BlinkBlinkBlinkBlinkBlinkBlinkBlink. Gulp Gulp! Take a drink when….a Cullen “high school” student is wearing an obviously non-high school outfit while attending high school. Drink for the full length of: Jessica’s zombie/leporasy/shopping analogy. Drink for the full length of: Edward’s parking lot stroll from car to Bella at the begining of the movie. Last person to jump up and do stellar Kong-Fu moves when Harry Clearwater says “My Kung Fu is strong” has to chug their beer. Best “Lykke Li” impression- must sing along with the movie! Gets to pick another player to chug their beer. Hope my drinking game helps you enjoy your New Moon DVD release party! Any other ideas of times to take a drink or take a chug? We guarantee first time success with our latest 642-825 dumps and also download 642-832 dumps and 642-845 dumps to prepare for next up coming exam. Bahaha Rachel that New Moon DVD party game is awesome! And totally hilar. And speaking of funny things: I found a book at Kmart (do you guys have that in the US??) and it’s a flip cover – choose your team! Front is Team Edward and back is Team Jacob. Anywho. In the middle there are glossy pics and there’s one of TayTay and Big Daddy sitting at some sporting event. Pretty sure you’ve used the pic on here so obvi, I thought of you. Basically it’s a lameass biography of Rob and TayTay, but the chapter names for Rob’s section is effing hilar. I was going to buy it merely for the hilarity factor but I didn’t want to waste $13. Whoa.what.is.going.on? Um, I swear to Rob that another LTTer and myself were just talking about alpacas yesterday!!!. Nothing to do with Taytay (although I do see a resemblance now that whomever did that dual image above points it out). That is so weird. Happy weeekend, and NM DVD release day everyone! I wish! It’s NOT DVD weekend here yet. We get the movies a day and a half earlier but the DVDs 3.5 weeks later. Please explain! So you’re an Aussie, too?? I got mine off eBay. Should be here in 2 weeks. Anyone know when it’s out in NZ? Take a drink …..each time you tell yourself ‘he was only 17’. Scull if you need to say it out loud. Shotgun a can if you feel no guilt what-so-ever. LMAO – That rule alone would get a person shnockered! Um, Griffs, we’re so doing this on Forks Tour 2010! Just stay away from the cliff afterwards. I wanna jump those cliffs…yes I do!! You in??? Did you get New Moon?? Did you watch it in all is glory?? Just so you know…don’t have email yet…lost it after the night we “talked” so if you have written I don’t want you to think I am not answering…still having tech difficulties..Dell and I worked til way late last night fixing lots of stuff but they are still saying they want me to send it back…not gonna happen..and why can’t they have English speaking techs?? At least the advanced techs?? Aw, MidCyn, hate to hear you are having technical difficulties. 😦 Hope you get e-mail back soon! OME, I am watching NM now! BluRay on my new tv! I love my Unicorn so hard right now for helping hooking me up today! You may come too! I can’t afford airfare for you…so, you’ll have to expense that, but you can certainly come! Well, I watched my New Moon DVD last night…ended up with 2 other ladies watching along, but I was the ‘knows-far-too-much & hence-wincingly-embarassing’ older fangirl…who never normally feels that way because I only admit stuff on here, or to my BiFF…sigh. It downed the thrill of getting it early. At least it has a better wig than Jacob in NM…can someone not CGI that sucker? And…how is everyone today? Lovely to see you all, hope you’re all having a lovely lovely day, & that everything is lovely. Because of yesterday I suggest we have an excruciatingly polite day ending in a group hug & maybe a few tears. Oh I feel you pain. I was talking to a friend of mine on the phone this morning and telling her I was going shopping after my DH gets home since the kiddos are still sick and was telling her about how I am going to have to buy 3 copies of the NM dvd because not one copy has everything on it. She was kind and listened to my rambling, but was not feeling my pain. It was obvious. Nice to know there are other “older fangirls” that we can talk to who understand the importance of today’s DVD release. 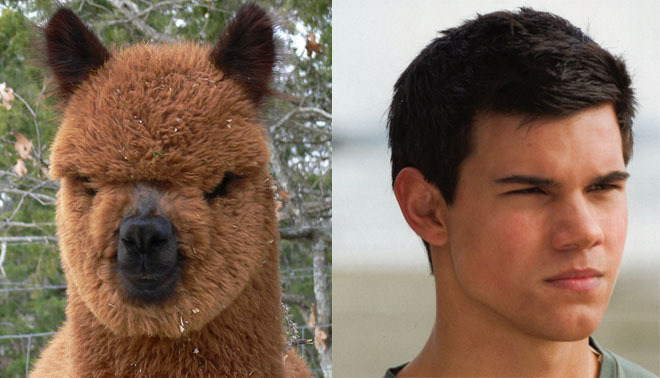 I also like the Alpaca/Taylor resemblence. My babysitter is going to think that is a hoot! Okay, time to go and check on the kids and get my workout in. Enjoy a beautiful Saturday! So this brings up a great point. I think I will write a long-winded, 10-paragraph post philosophically comparing Taylor to an alpaca. Just kidding. I am all posted out after yesterday. I’ll just say that I didn’t know that owning an Alpaca & having Taylor as a lover might be a weird dream. Have a great weekend everyone! I agree with eatmyjorts, let’s all have a pleasant and polite weekend filled with butterflies and “unicorns.” Give peace a chance. I’m off to search for the Eclipse preview from the Walmart DVD and all of those cut scenes from the Target DVD on the interweb b/c Canadian NM DVDs are lame. Glad you said that. I was beginning to think I wasn’t looking hard enough or smth!! WOW this comparison makes me want to start an Alpaca farm, I mean this particular Alpaca seems like it’d look good in flannel. I think I’m on Team Alpaca now, just can’t get enough of its little scrunched up face! Maybe Summit could cast him for Breaking Dawn? There is something eerily similar between the two of them though. Haven’t watched the NM DVDs yet. I can’t wait to see the 7 min of Eclipse sneak she got and all the features between the two of us. Now where the heck is she….. ? I have to say I am bummed that I can’t do the drinking game (was in a pretty major accident recently and Drs say, among many things I’m not to do, I can’t have alcohol yet… ) but believe me, when they give me the all-clear, I’m SO having friends over and playing that NM drinking game!! I cant’ wait. You could always play the drinking game with water. People always say we should drink more water. That game would keep you plenty hydrated! anyway,..they have some great red “sparkling” yes sparkling is definately indicated when watching Edward..but I digress…they make a great Red sparkling non alcholic wine and if you like beer my hubs likes the Sharps non alcohol beer…just a thought so you can play safely! 🙂 and not feel left out..get better soon..!! Thx I have to say I would not recommend breaking your neck 😉 it isn’t fun. No that wouldn’t!! 😦 though did have bleeding and bruising on the brain. Did that happen to you…breaking you’re brain? I have to say I got very lucky: alive, walking, talking…supposed to eventually get back to “normal”…scared the crap out of my husband & family. Enduring the neck brace and book full of restrictions. Feels like I’m not able to do anything. bah! Just came back from Target, and guess what I have? I never saw so many “mature” women trying to look nonchalant around a 4 panel display. It took everything in my power to not buy that Edward “leaving you was the hardest thing i’ve done” lunchbox. My Kung Fu is strong. LOL – that’s exactly what it was like for me last year when I went to Target to get my Twilight movie! There was like one tweener girl, and the rest of the people surrounding the display were 20s, 30s, 40s, 50s…. etc. Don’t you always wonder if any of them read LTT? Yes!! Love this idea! I saw a woman yesterday with a bag that said “I ❤ Boys That Sparkle." I wanted to talk to her, but I couldn't think of a tactful way to ask: "So, are you a Twi-crazy or do you just have an acute fondness?" I think a badge that said ‘They’re not bears’ is something I could get behind. Great idea for the LTT shirts, how cool would it be to make them available only to LTT Ladies…like our own private club logo that would identify us to each other! and in small green letters circling around “If you have to ask…don’t”??? Just an idea! I wonder it about practically veryone I meet. I think it would be pretty cool to happen upon another reader in everyday life. The display was surrounded by dudes when I got my copy! PS – and you’re SO right about everyone (including myself) TRYING (unsuccessfully) to look all nonchalant like it was no big deal walking up to it, but the way everyone snatched their copy like a cobra strike gave everyone away. @Ang..My Kung Fu would have flown out of the window…you so know I would have bought that lunchbox..for one of my kids..yeah for one of my kids…I want to go shopping!!! I miss out on all the good stuff…I can only imagine what my livingroom/bedroom would look like if I actually saw all the Edward merch out there..so jealous..
P.S. I hadn’t read your above comment b4 I wrote my earlier one where I asked if you had watched NM yet…can’t wait to hear how your experience is on the BIG screen…Did I tell you that lipgloss is very very hard to clean of the flat screen??? MidCyn…the new tv is awesomesauce. Thank you for the lipgloss warning. Now…what’s a good fabric for wiping off slober? OFTLOE…Purple terrycloth!! You KNOW why!! Me likey my secret box. 🙂 And it is MUCH more mature. Oh yeah, I’m sure more NM merchandise will find it’s way into my home soon. No need to buy out the display in one trip though. Hope you enjoy your trip to Walmart! I went to our local grocery store to get the dvd last night, and there was only two people waiting for the doors to open, so instead I went to Borders where they had a midnight release party. I missed it, but I got there in time to meet Catherine Grimme, the little girl who played Bella in the ballet scene in Twilight. She was so cute! She was signing photos of her with different members of the cast. I got one of her with Rob and another with her and Peter. She was all out of the other cast members. I didn’t get my picture take with her, but I got one of her signing, and one of her smiling at the camera. Do you live in Portland?! I live in Tualatin, 20 minutes south of Portland. Ugh! I’m angry at Twi-Daughter now. BTW I wasn’t expecting you to get me to Forks..lol..I just wanna go with you guys cause I know we’d love to see all the same things…this coming from someone who never leaves the house…I can always dream tho right..cause I would love nothing more than to go to Forks and get the full experience..plus its on my bucket list.. Think of this: there was a time where if someone had told you that one day you’d be posting comments daily on a blog you wouldn’t have believed them. Just look at you now! @absolutelyvlc..You are so right! <3!! Somedays I think ppl wish I hadn't started…lol…but I thank God that I found LTT and my friends here…I was a point where I really didn't think I could take the isolation for even one more day or that I could come to terms with the loss of my entire social network, both friends, family and co workers..now I am able to smile everyday, ok most days, lol..b/c of everyone here..I know that sounds kind of sappy but imagine for a moment that you were loving your life, job and friends and then the next your housebound with a body and mind that doesn't work anymore. That everything in your world had changed and was unrecognizable? All the elements of what made you who you where was gone?…its very strange, terrifying at times and hard to explain to someone..anyway..for me being able to come here gives me some sense of normalcy, routine and most important friendship. I guess that is why I get nervous about making mistakes or the whole downthumbs thing, silly I know but its all I have. I call it my lifeline b/c it is..I have come to adore so many ppl here and really care about them..I didn't think I would have that ever again and am always afraid I am going to lose it.. Geez..I don't know where all that came from…sorry!! Anyone going to Forks must DM me on the forum or Twitter so we can meet for a Bella Burger and a Vitamin R!! This is my new LTT rule. So apparently I bought the DVD that doesn’t come with the deleted or extended scenes =( wtf. The making-of documentary was very good though!! oh that stinks…. why do they even have a million versions??? Why can’t they just have one awesome DVD with everything everyone wants to see in it. Absolute crap I tell you. And thanks HULTRG for that deleted scene. Just watched the 4 part deleted scenes…big mistake taking them out..more Edward is always a plus and love the extended version of Jacob & Bella…I swear they take out some of the best parts…why??? Which DVD did you end up with? You should have come to my house for my little New Moon party! I served blood oranges and invented a cocktail called Face Punch. Ahh, I don’t yet own the DVD either. My nephew’s wife came over for a little Twi-athon. She brought her DVD and I provided food and punch. Facepunch cocktail? That sounds amazing!! hahahaha Love it! i know… I dont know why they took them out… did you see the deleted scene with Victoria with the creepy dead guy?? Here is the link for the 7 min. Eclipse extra…hope I did this right? Oh wow you got soooo much more in the US sneak peek than we got here in the UK, ours was about half the length of that one and nowhere near as much detail! I was out all yesterday so didn’t have time to search. Good thing for you and your Edward-induced insomnia. I love that we got to see the potato chip scene. I am so excited about Eclipse. Thank you for writing these books so we can also have these movies to look forward to (and the graphic novel that came out this week was pretty sweet, too). You look great in the clip. Can you please write more books now, too?! Ignore all of the jealous sour grapes morons out there and just DO THIS. We’ll facepunch anyone who tries to get in your way. Don’t think that I don’t know how pathetic it is talking to myself like this! The thought of Edward keeps me up at night too… you are not alone! You didn’t drink enough Face Punch (which is unrelated to the unicorn below). As soon as I set the laptop down I passed out for 4 hours on the couch. Awwww… I WUV them both! And that gif is a total ROFLcopter! Lolol! Am now in my 4th viewing of the NM DVD tonight… Yipee!!! I agree they look better on tv than in the movies! I think the makeup artists are still trying to figure out how to get that “natural vampire look” right for hi-def. I love that “natural vampire look” seems totally normal to us. I feel sadden at the fack that I never recognized the resemblence! Also that I was out before she went to italy…playing my own drinking game with my hubby. Basically anytime there was a product placement! Will play again only with kool-aide and my 6 year old! We’ll see who wins! He’s going down! Any LTTr’s in UTAH? Come out come out where ever you are! Yippee!!!!!! That’s great news. I see a good night’s sleep in MidCyn’s future. Edward is once again in my arms…squeeeee!! However for supposedly being in the bottom of a clean laundry basket he is not smelling like “my Eddie” so giving him a bath..twss.. Giving major ❤ to the hubs for the retrieval AND for an early Birthday present…he bought me the book Eclipse!!! ITS HUGE!!! (twss)but I am going to try and start reading it!! (He said it was actually a gift from middle daughter for causing me such distress..). Even a freak snowshower this morning cannot ruin this great day!!! HUGE CULLEN SMILE…. Sounds like fun Cyn! Good luck on Eclipse. It’s quite epic. Possibly my favorite in the series. I’m also glad you’ve got Blanket Eddie back! As for Eclipse…will I be able to “follow the story” not having read New Moon and only seeing the movie version?? I tried reading a couple of pages..I think it may be more than I am going to be able to do..however..I said that about Twilight too…but after seeing the trailer I really want to know what happens in Eclipse!! Just seems iike a huge undertaking…but Imma thinkin it may be well worth the effort! Eclipse has a few hot scenes in it. Even if you can’t follow the story skim for the makey outey parts and put a post-it to save the spot. I think you should be good to go to read Eclipse. New Moon (movie) was actually very true to the book. I can’t really think of anything that was left out. Good luck!